Roll out the barrels and add a dollop of country charm! The simulated fir wood barrels of this trio of planters have authentic metal banding and are fastened to sturdy wooden posts. Its hinged tri-level design gives you the freedom to adjust it to fit anywhere in your yard. Item weight: 6.9 lbs. 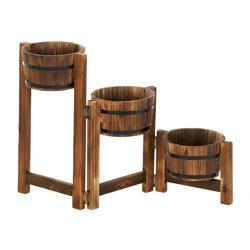 Open: 36" x 9¾" x 22 5/8" high; closed: 12½" x 9¾" x 22 5/8" high; each bucket is 9½" diameter x 5" high. Fir wood. Plants not included. UPC: 849179005122.